Thayne-san, today we’re going to be visiting an old shop right by Kanda Myojin (Myojinshita Kandagawa Honten). 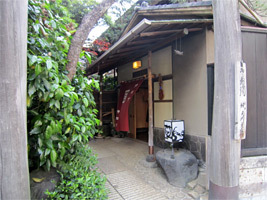 It’s an unagi or eel restaurant that was founded in 1805. I’ve been really looking forward to this visit. Every time I passed this shop on my bicycle, I wondered what kind of shop it was. Right across the street is the Akihabara district, full of electronics shops and maid cafes, and yet here it’s so quiet. It’s like a different world. Hi Thayne-san and Concierge-san. I’m Kanda, the owner. Good afternoon, Kanda-san. Thanks for having us. 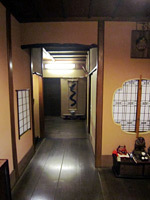 Your shop feels very Japanese from the moment you step inside. Thank you. 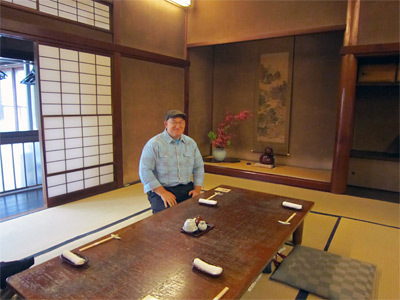 An atmosphere reminiscent of Edo is one of the things our restaurant is proud to offer customers, so I hope you can relax and enjoy your visit. Today we’ll be serving you lunch, but as a rule we don’t start preparing the food until we take the customer’s order, and so it will take about 40 minutes. Should we talk in the meantime? Yes, that sounds good. But I have to ask, does it always take that long to prepare lunch? Yes, it does. To make kaba-yaki (broiled eel) we begin by cutting open the eel. In Kansai they open it along the belly, but in Tokyo we open it along the back. Edo was a samurai town, so any reference to seppuku would have been frowned upon. They say that’s why fish like eels are opened along the back and not the belly. Is there any difference in taste between the two? No, I don’t think it makes a big difference. Next we put skewers through the opened unagi, passing through the thickest part of the meat at each point. The skewers are inserted to make the unagi fan out. That way the skewers is straight when it’s finished cooking. The points of the skewers need to be even. It’s elegant work, and it makes for delicious unagi too. That’s right. The next step is to broil the unagi without any sauce, a process called suyaki,　it takes off the slimy texture of the skin. We call that step tegaeshi-hyappen, or “repeated flipping.” We turn the unagi over and over again over the fire. Then we steam it. The steaming process is unique to the Kanto region, and that removes excess oil. 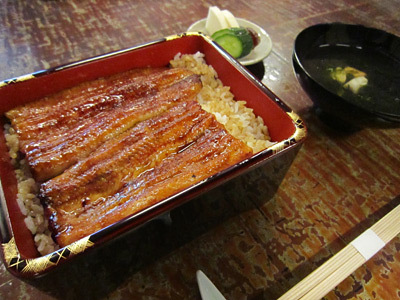 Depending on the individual eel and whether it was wild or farmed, they’re steamed for an average of 15 to 20 minutes. And then finally you dip it in sauce and grill it for a nice roasted look, right? The aroma is totally irresistible! Kaba-yaki looks like a simple dish to make at first, but it’s actually quite a delicate process that requires lots of training. By the way, the powdered sansho (Japanese pepper) sprinkled on kaba-yaki is quite an interesting spice, don’t you think? Yes, indeed. Sansho has a poison-neutralizing effect and so it originally had a very practical function, but it really brings out the flavor of kaba-yaki. I think it’s the best possible spice to compliment the dish. In a similar sense, narazuke pickled vegetables are served with unagi, which helps to freshen your mouth after eating the slightly oily unagi. Wow, that’s interesting. I’ve never thought about that. Incidentally, this area around here is called Kanda Myojin Shita (below the Kanda Shrine)―and so the residents here are looked over by Kanda Myojin. This year will be the first Kanda Shrine festival in four years. Yes, it’s really a special time. Festivals are great, but I’m sure it’s a lot of work for the people involved. Now that’s style! Perfect, your unajuu is here. 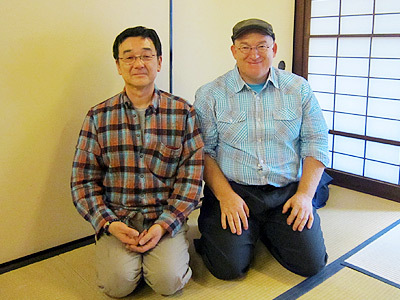 Thank you so much for your time today, Kanda-san. Well, let’s enjoy!